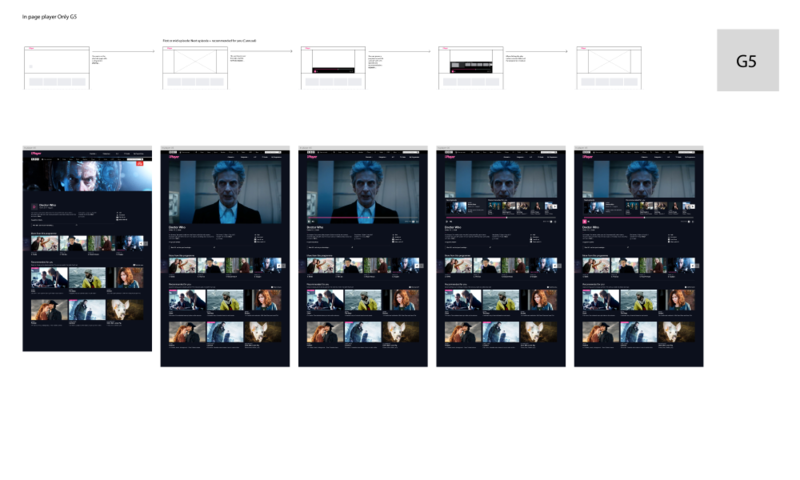 iPlayer was scheduled to have a backend system transformation, which presented an opportunity to implement an updated UX, visual and interaction within the playback space. With the increase usage of online viewing and decreasing user activity with offline viewing a new experience for how immersive viewing and countious journeys could reshape how content is view within the digital space. HMW transform iPlayer's online playback experience and present continous journey opportunities with modernised UX, visuals and interactions, which can transform the digital viewing experience for the new generation content viewing habits? A kick off meeting was organised by the senior designer to bring together a mix of team members i.e. 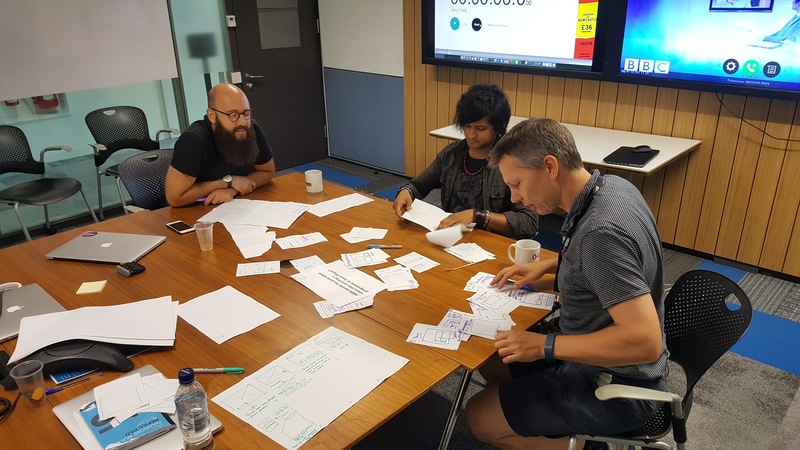 ux designers, developers and Business Analysts to ideate on the topics of immersive and continuous journeys for the playback space of iPlayer. 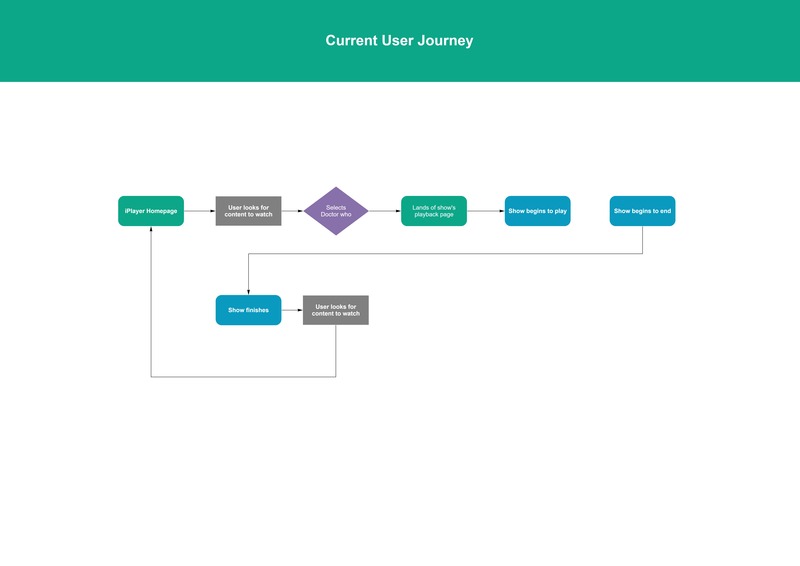 This user journey map was created to find see what the current journey map for view content looks and to see what other journeys exist after a show ends. 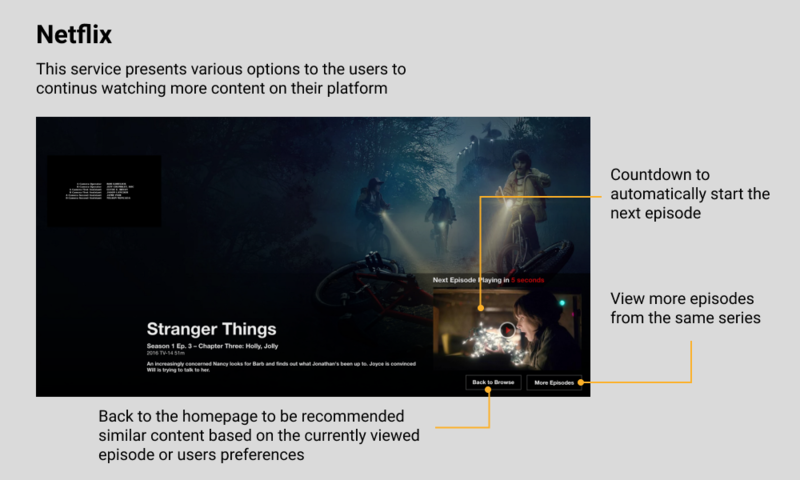 Post trailers and immersive playback has become a common feature among other video on demand services such as, Netflix and Prime. What are they doing to create opportunities for onward journeys? 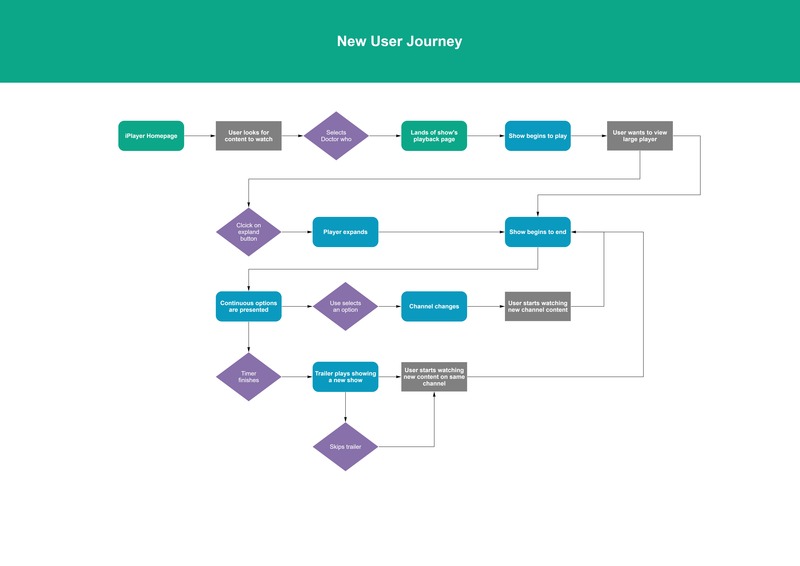 This user journey map was created to find out how the iPlayer Playback team was able to create entry points for making the video experience more immersive and to provide the users opportunities for countinous journeys. 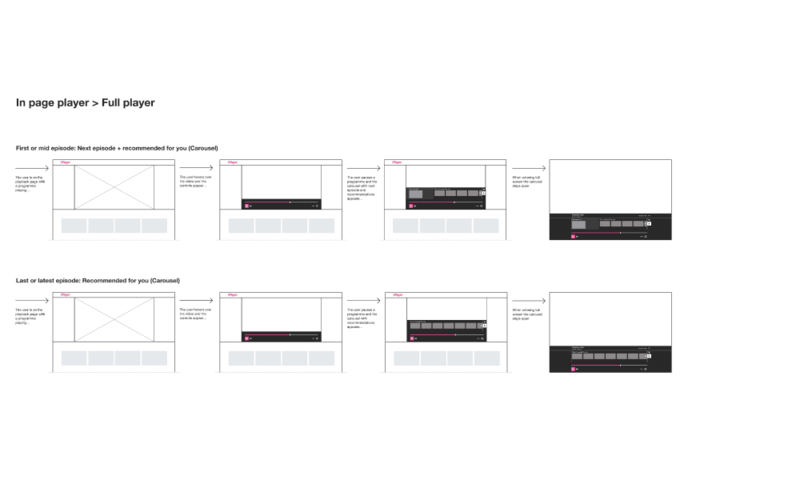 Basic wireframes of the new parts from the refined user journey map highlights the touch points where the user will interact to trigger the new features. A high-fi version of the wireframe were created to bring the designs in line with the current iPlayer playback look and to prepare for an interactive version. An interactive prototype was created with Proto.io. This allowed the users to interact with the design in a life-like experience and also gave the users multiple paths on how they could travel through the journey. 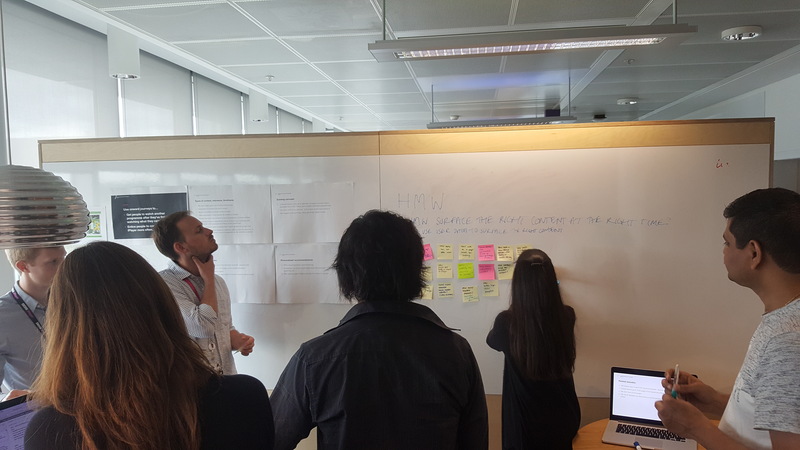 User testing took place with the various design solution to find out which one is more desired and easy enough for all our user types to use. Lab testing sessions were done with 6 partcipants who all came from different backgrounds. They provided insights on the 3 types of prototypes, which has been documented for further analysis. From the lab testing we were able to gather great insights on how users from different backgrounds and needs would interact with the two new features; immersive player and continuous play. The results from the testing showed us the changes that needed to be made, but overall we were able to handover the specifications to the development team for the next stage and perform A/B testing to gather quantitative insights. By collaborating with the business analyst and dvelopers the UX team was able to construct a an A/B testing plan by using Optimizely. The A/B testing allowed the iPlayer team to provide the new features to 50% of our user base and to gain quantitative insights on how the features are used at a larger scale. The insights would be used to discover areas which could be improved on such as, the countinous play timer timer duration. This project provided me with many opportunities to develop my processes from discovery to delivery while interactinge with differnt stakeholders and teams members. I was mentored by the senior UX Designer who showed me good practics for facilitating workshops, guerrilla testing and lab testing. Futuremore, to use different methodologies such as A/B testing with the Business Analyst and Developers to gather quantitative insights on released product. My learnings from this roject have been applied to other projects while with the iPlayer team and also beyond the BBC.